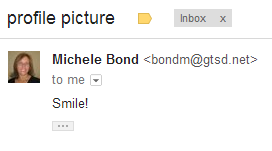 You probably noticed this smiling face when reading messages from me in Gmail. Like any internet avatar, a photo or image will help connect a face to the name. This is an optional feature. GTSD staff are invited to customize their Google Apps account with a photo or illustration. This image will be connected to all GTSD Google Apps services, so choose wisely! Have a digital photo or image file that is accessible to the computer you are using. When logged in to Mail, click on the Gear icon (right side, below your email address). Scroll down until you see the Picture section. Click the link "Select a Picture". Browse to the location of the image you plan to upload. Resize or reposition the visible portion of the image if appropriate. Click Apply Changes. Choose a photo of yourself that you like, one that portrays you in positive and professional manner. Select an image or illustration that highlights your subject, grade level, or role within the district. Images or illustrations should be school appropriate. Be sure you have permission to use the photo or image (this means professional photos of yourself and many images from Google images may not be appropriate). No too-personal information, such as last names, addresses, etc. Images, and the ideas they represent, must be school appropriate.